Om: The problem with using physical albums is that if a photo file is moved to a different folder, the next synchronization process will delete the original file info from the database and re-create it in the new location. This means all of the metadata associated with the item (tags, description, etc.) are lost and have to be entered again. Physical Photo Move (PPM) is an extension that allows an existing item (photo, video, or album) in a physical folder (i.e., not in the upload folder and linked into a virtual album) to be moved to another folder, preserving all metadata. Om: Gør det muligt at ændret tooltippet på billederne i albummer. Om: Media Pump - A tool for preparing media files (images, videos) and uploading to a Piwigo server. album on a Piwigo server. * Convert video to MP4 and upload the MP4 videos to a selected album on a Piwigo server. * Create / Edit albums. * Easily add titles (captions) and tags to images and/or videos. * Indicate an image or video to become the album highlight after it has been uploaded. * After loading a mixed number of images and/or videos into Media Pump, mark those to be uploaded into the selected album. Remaining unmarked images and/or videos can be uploaded to different album. * All images supported by Image Magick "convert" can be re-sized. * All video formats that can be converted to MP4 using ffmpeg can be converted. * Images not having EXIF metadata containing orientation information can be manually rotated. * Copy/Paste. In a file browser, navigate to folder containing images and/or videos, copy to system clipboard and paste into Media Pump. * Image and video conversion commands in which Media Pump invokes are defined in a external XML file that can be tweaked to achieve desired results i.e. Image conversion size, video conversion size, watermarking, conversion quality. * Download items from an album to a directory on the file system; supports recursion of all sub-albums. * See README.html or README.md in media-pump.zip for more information regarding features. 1. Ensure Java Runtime Environment 1.7 or a later version has been installed. The "java" executeable must reside in the system path. To verify, execute the following in a CMD shell which will display the version of Java installed. If an error occurs, then java is not in the system path. 2. Ensure Image Magick software suite is installed. 3. Extract media-pump.zip to an empty directory i.e. "C:\media-pump"
4. Execute the script "create-shortcut.bat" to create a Desktop Shortcut. 1. Ensure Java Runtime Environment 1.7 or later version has been installed. 3. Extract media-pump.zip to an empty directory i.e. "/opt/media-pump"
Instructions will be provided soon once I get a Mac OS VM setup to test. 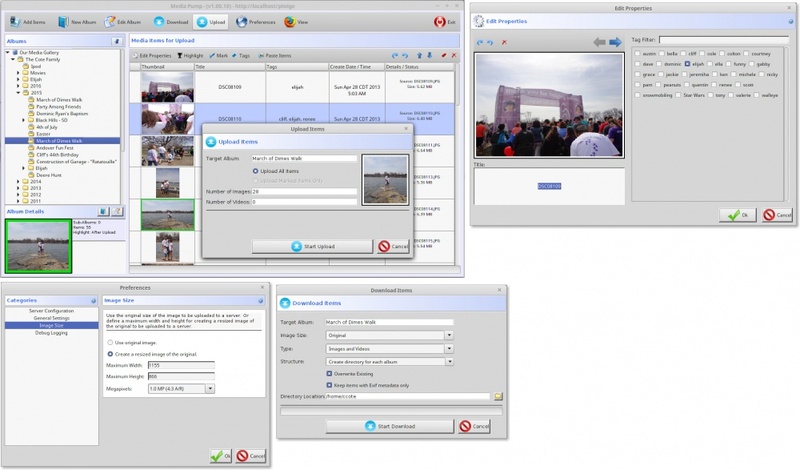 Video: The following two requirements are needed to support converting/uploading video. - FFMpeg installed on client. - piwigo-videojs plugin installed on Piwigo server. Ændringer: * Added the ability to easily add tags to images and videos prior to uploading to server. * Specify maximum width and height of image size under preferences or indicate to upload full size image rather that converting image to smaller size. * Provide better information when an image or video fails to convert or upload; a "View Details" button will be displayed in the table to display conversion logs and errors. * Provided more documentation information in a README.md / README.html file. * Other minor bug fixes. Om: Better No Right Click disables right click on Chrome, Firefox, and Internet explorer by replacing the image the user tries to save. This Plugin is my first and is inspired by both the right click plugin by VDigital and by java script programmer Keith P. Graham. I have a background in PHP and Java but the nuts and bolts of this plugin go to those guys. Ændringer: This plugin works by replacing the clicked on image with a dummy.